If Guangzhou had the same density as Seoul, it could accommodate another 4 million more people on top of its current 15 million. If the city of Guangzhou, the capital of one of China’s wealthiest provinces, had the same density as Seoul, it could accommodate another 4 million more people on top of its current 15 million. That’s according to a new report by the World Bank that calls on China’s urban planners increase the density of its cities instead expanding its existing urban centers, or constructing entirely new ones. China is in the middle of moving about 100 million rural Chinese to cities as part of an urbanization drive intended to help the economy. By 2020, a total of about 1 billion Chinese people, or 60 percent of the population will be urbanized, the government projects. But observers say it’s been difficult to direct the flow of rural migrants, who have traditionally moved to the larger coastal cities where urban sprawl, traffic and pollution are getting worse. According to the World Bank, one answer is denser urban development, which reduces commuting times as well as congestion and pollution. Denser cities could save China about $1.4 trillion in infrastructure spending, or the equivalent of 15 percent of last year’s GDP, the report says. And denser urban planning should help conserve the shrinking amount of land that China has to feed its population, which has lowered the country’s self sufficiency. 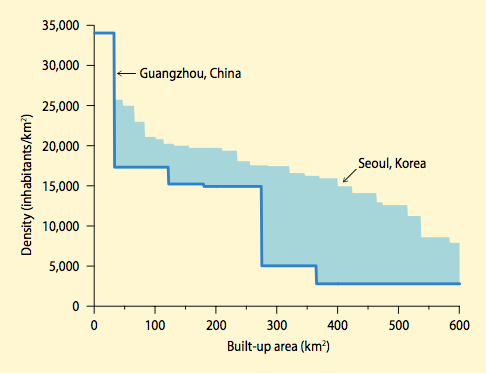 If higher density makes so much sense, why haven’t Chinese cities embraced it already? One major reason is that local governments are highly dependent on selling undeveloped land to developers. Redeveloping existing cities to make them more dense wouldn’t result in any local government revenue. The World Bank notes that “denser urban planning would curb local governments’ reliance on land-based financing and limit the risk of unregulated borrowing,” which would surely be a good thing for China’s economy in the long run. But that very reliance is also the biggest impediment to the smarter, denser, urban development that the country needs.